Xanaland Neutral Cat News! : Queens Of The Stone Age Reunion ' Feels Like The First Time' For Josh Homme, But Will Vedder Break Out The Cowbell? 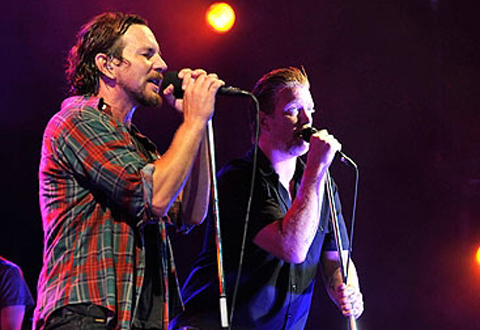 Queens Of The Stone Age Reunion ' Feels Like The First Time' For Josh Homme, But Will Vedder Break Out The Cowbell? Reuniting with original bassist Nick Oliveri was one of the easiest things about making Queens of the Stone Age's new album, . . . Like Clockwork, leader Josh Homme told MTV. 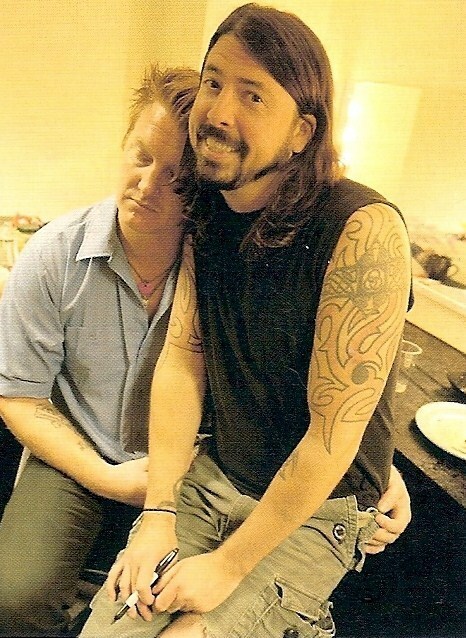 "Nick and I have been friends since a couple weeks after everything went down," Homme said, referring to the bassist's firing from the band in 2004. "People don't know that, and it would be awkward for me to run around making sure everyone knew it." Homme continued, "Nick recorded his new record at my studio, and then he was going to drop off some records and he said 'Hey, need anyone to sing backup?' And I was like 'Actually, yeah, come on in.' It's that causal, and that's a nice thing. It was easy. It's nice to know someone since you were a little kid, and still know them." Working with his childhood friend was one of the smoothest things about the tumultuous process of recording . 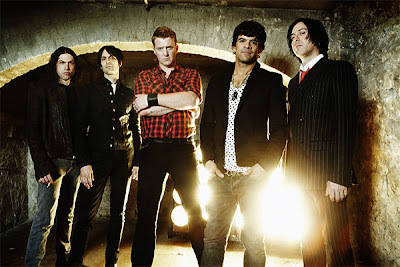 . . Like Clockwork, the band's first LP in six years, Homme said. "We'd have these great victories and then something would go south for a bit, and we'd go, 'It's like clockwork!' I think a sick sense of humor is what's always been our preservation mechanism, so this time, we're using that sick sense of humor for a title."
. . . Like Clockwork is due out June 4th, and now you can check out the official version of album cut "My God Is the Sun," which the band first performed live at Lollapalooza Brazil last month. Along with Oliveri, the new album also includes collaborations with Elton John, Dave Grohl, Trent Reznor, and Scissor Sisters frontman Jake Shears. But just for kicks and smiles and to make you think " I should have learned to play the geetar, I should have learned to play them drums" ....Here is Josh and Dave G at their best!